THR is reporting that Jared Leto was “heckled” by a transgender woman from the audience while accepting the Santa Barbara International Film Festival’s Virtuosos Award for his performance as transgender AIDS activist Rayon in Dallas Buyers Club. “Trans-misogyny does not deserve an award,” yelled out the unidentified woman, adding that Leto didn’t “deserve an award for playing a trans-woman” because he is male. Leto and the unidentified woman continued the back-and-forth, arguing that straight people always play transgendered characters and receive awards for it. Leto repeated his argument that by her logic, only straight actors could play straight roles. “Then you’ve made sure people that are gay, people that aren’t straight, people like the Rayons of the world would never have the opportunity to turn the tables and explore parts of that art,” Leto said to applause from the audience. 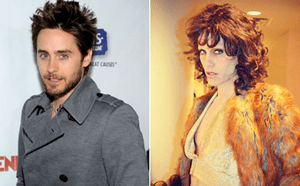 Though Leto and the woman were spotted after the confrontation having what was described as a “cordial” conversation, both her and Leto’s statements (even though his didn’t t really respond to the point that she was making about trans actresses actually playing trans roles) did make valid points about the state of openly LGBT actors in LGBT roles as well as the role of transformation in art.